There are two types of bands that have long, successful careers. The bands that stick to the basics and the same tried and true formula that keeps the punters happy and screaming for more of the same – AC/DC, The Ramones, Motorhead – you always know what your getting from these guys. Then there are the groups that can reinvent themselves, change direction and bring along the fan base – U2, Bowie and Costello. Its a brave thing to try and change and its difficult to successfully bring along the fan base – Kiss, The Rolling Stones and even The Pogues faltered and stumbled when they did something outside the expected. So when FM put out “Don’t Shut ‘Em Down” as a teaser it was one of those “what the [email protected]” moments as the entire FM army scratched their head. No pints! No pirates! More The Jam with a Celtic/industrial bent meets Billy Bragg and Michael Moore – the Detroit move must have really influenced Dave’s outlook on life. So, what’s the rest of the album like – a mix of the newish stuff and stuff that would be more at home on Float or Within a Mile of Home. Unfortunately, if any of those oldish tracks did make it onto either of those album they wouldn’t be the memorable ones – and there lies the problem, good songs don’t just cut it for FM, they can’t be merely good and experimental, they need to be great (or have at least 3 great songs) and experimental to pull it off. They only get close once to great once on the track “Revolution”. I’m going to give some of the benefit of the doubt to the use of new producer (Ryan Hewitt of Red Hot Chili Peppers fame) and blame him for the newish tracks and the dulled sound and I’m gonna claim Speed…would have been so much better with Ted Hult or Steve Albin behind the glass. 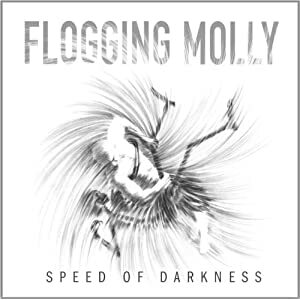 This entry was posted in CD Review and tagged Flogging Molly by Mustard Finnegan. Bookmark the permalink.